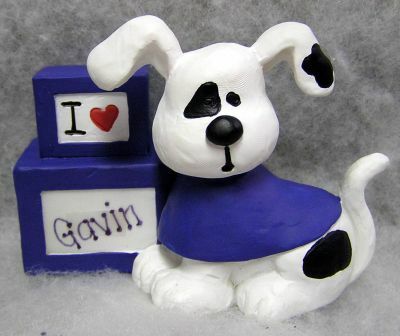 These resin dogs come in two styles: Brown Spotted and Black Spotted. 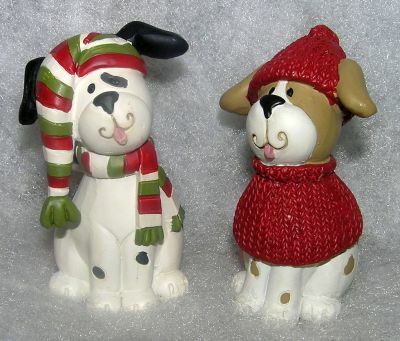 The black spotted features a striped hat and scarf and the brown spotted has a red knit look hat and sweater. They measure 3 x 1 3/4 x 2. This canvas sign has multiple blinking lights and a cute dog and cat with snow hats. 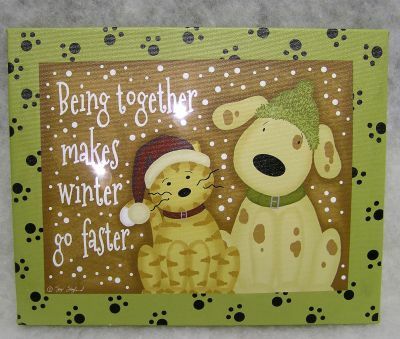 It also has a paw print border and says "Being together makes winter go faster.". This uses 2 AA batteries which are included. It measures 8 x 10 x 3/4. 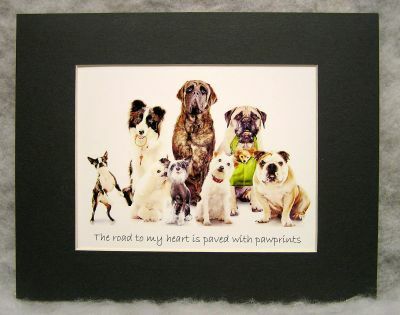 This adorable print features a variety of dogs and says "The road to my heart is paved with pawprints" at the bottom. It has a green mat and measures 8 x 10 with mat. It is also available in a framed version - check listing that follows. 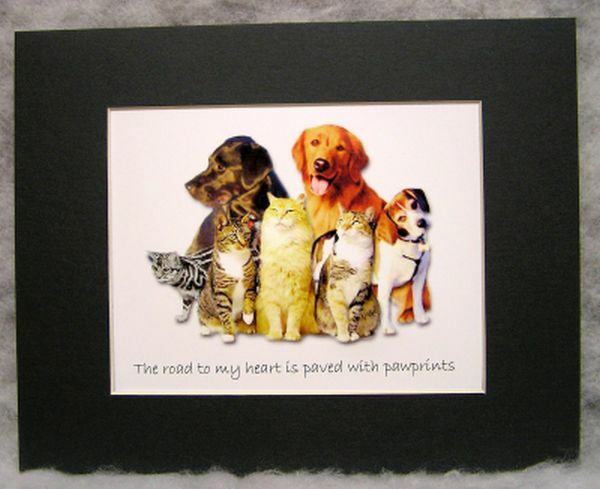 Lots of cats and dogs are featured on this print. 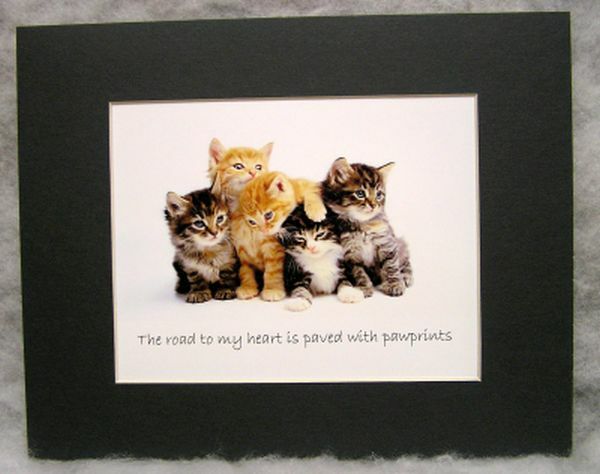 It says "The road to my heart is paved with pawprints" at the bottom. It has a green mat and measures 8 x 10 with mat. It is also available framed - check listing that follows. This print features a group of adorable puppies. 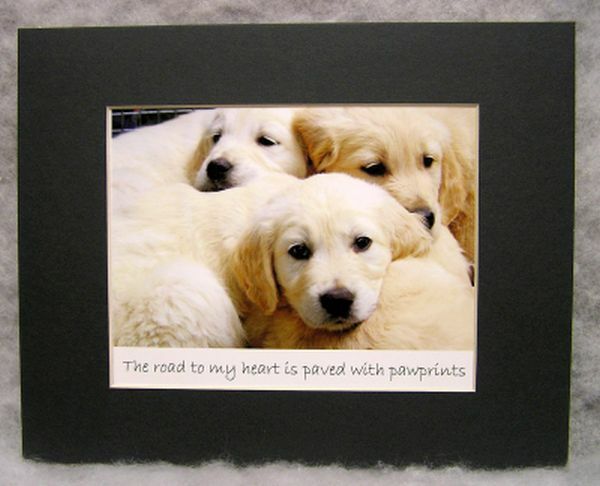 It says "The road to my heart is paved with pawprints" along the bottom. It has a green mat and measures 8 x 10 with mat. This group of cute little kittens is featured on this print. It says "The road to my heart is paved with pawprints" at the bottom. It has a green mat and measures 8 x 10 with mat. It is also available in framed - check listing that follows. 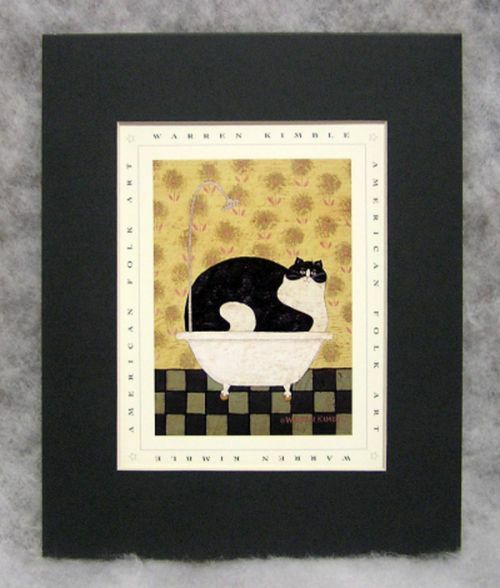 This primitive print is titled "Cat in a Hot Tin Tub" and is created by the artist Warren Kimble. It has a green mat and measures 8 x 10 with mat. It is also available framed and without mat - check previous listings. 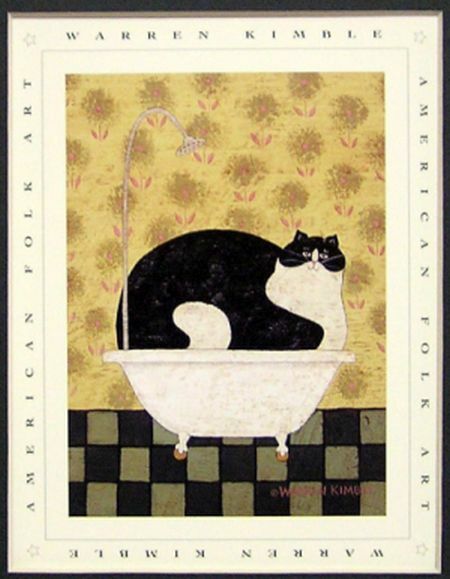 This is the American Folk Art print by artist Warren Kimble that does not have a mat. It is titled "Cat in a Hot Tin Tub". It measures 8 x 10 and can be matted to 5 x 7. 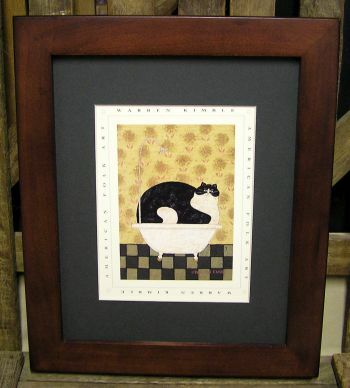 This is a sample of what the matted prints that preceded this selection look like as framed items. It is available in the cherry stain (shown) as well as a black in the same style and has glass. This cute spotted dog is sitting next to several blocks. 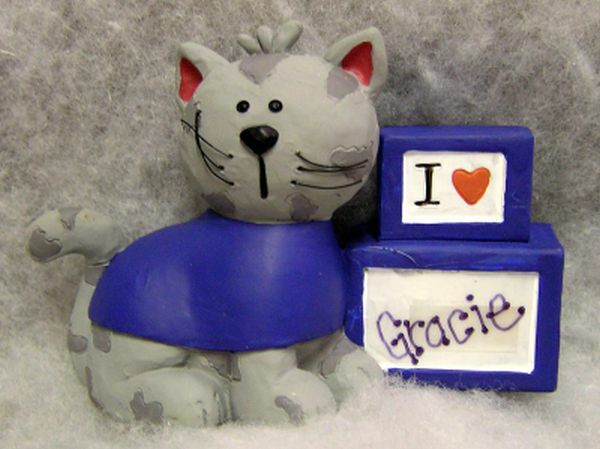 The one block says "I (heart)" and the other block is blank to be personalized with whatever you would like. It measures 3 x 4 x 3. 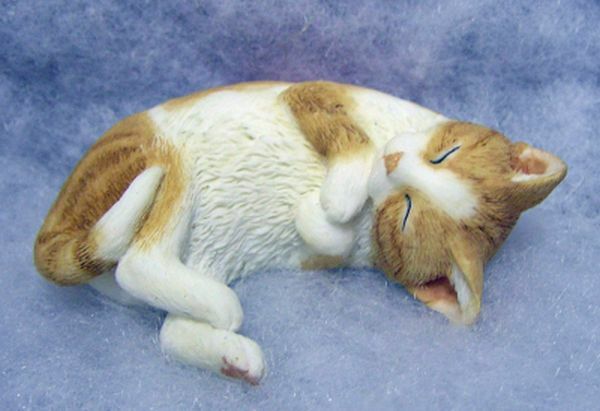 This is a delicate ceramic little kitty. It has white and tan fur and is snuggled up and sound asleep. It measures 1 x 2 3/4 x 2. This cute gray cat is sitting next to 2 blocks. The top one says "I (heart)" and the bottom one is blank to be personalized with whatever you would like. It measures 3 x 4 x 2. 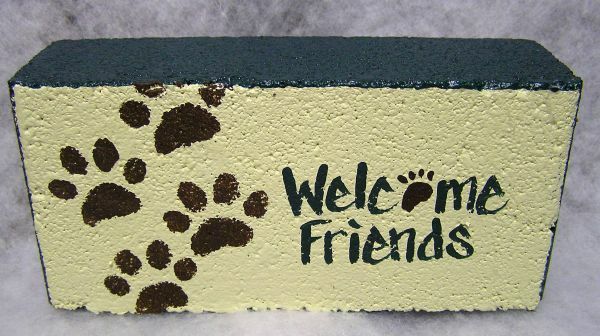 A set of pawprints is hand painted across this original design brick. 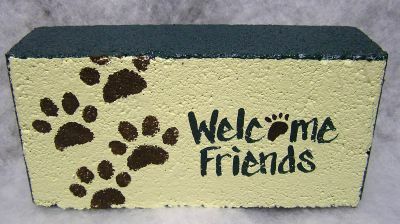 It says "Welcome Friends" and can be personalized with whatever you would like. It measures 3 1/2 x 7 1/2 x 2.